Well, I'm not there yet, but I will be this evening. Linus, Jackson Dominick, and Clark Krov are Grace's Confirmation class of 2019. We're carpooling with Pastor Abby and two girls from First UMC. That's right: Grace is destroying FUMC's Confirmation numbers this year! (That's a little neighborly competition; Rev Chris is one of my closest friends and he'd appreciate the humor. No need to call or write.) Please pray for Clark, Jackson, and Linus as they begin this critical phase in their faith life. We're beginning the process with a weekend-long retreat. Which means I will not see you Sunday; thanks to Hal Hinckley for pinch-hitting for me. This morning as I was packing I remembered an episode from my ministry memory banks that goes back a couple of decades. I was serving as an associate pastor at Oak Lawn UMC, Dallas. The senior pastor was away for the summer, a combination sabbatical/study leave. The other associate, Rev Patsy Brundige, and I were in charge. This was very dangerous, for many reasons. One afternoon we were in her office plotting (you know, the whole "when the cat's away the mice play" deal). Her office was right next door to a newly renovated and decorated Prayer Room. What was once a broom closet had been transformed into one of the most beautiful spaces in an already gorgeous building. Patsy and I were talking about the spiritual phenomenon of that summer: a book called The Prayer of Jabez. Do you remember it? You may even have a dusty copy of it somewhere. 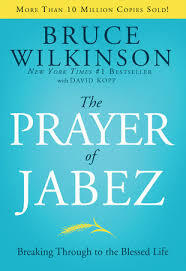 Anyway, the book mentions an obscure priest from 1 Chronicles 4:10: "Jabez cried out to the God of Israel, 'Oh, that you would bless me and enlarge my territory! Let your hand be with me, and keep me from harm so that I will be free from pain.' And God granted his request." That's it-- an entire book and subsequent journals and Bible studies based on that one verse! We could all be millionaires! Anyway, Patsy and I began praying that prayer and sharing it with others around the place. A few weeks later-- you won't believe this, but it's true-- we agreed to stop praying that prayer. So many ministries and events started happening out of nowhere. This included funerals too. So much ministry that we struggled to manage it. "Increase my territory" is vague enough for the Holy Spirit to blow through and start making things happen. Prayer is funny like that. And just because we stopped praying those specific words doesn't mean the Spirit stopped working. Many years after I left-- and returned and left again-- Oak Lawn's territory has increased. In ways no one could have imagined. In many non-traditional ways, for what was a very traditional congregation. I'm not taking credit or blame for any of it. As Paul writes in 1 Corinthians 3:5-9: " What then is Apollos? What is Paul? Servants through whom you came to believe, as the Lord assigned to each. I planted, Apollos watered, but God gave the growth. So neither the one who plants nor the one who waters is anything, but only God who gives the growth. The one who plants and the one who waters have a common purpose, and each will receive wages according to the labour of each. For we are God’s servants, working together; you are God’s field, God’s building." I am about do something equally dangerous, potentially overwhelming for me and all of us at Grace. As God's field and building, let's pray that prayer. Buy the book if you want-- no requirement there-- but we can all pray for free. "Increase my territory." "Increase Grace's territory." Here's why I am feeling led to pray that prayer and invite you to join me: I am convinced 2019 is going to be an amazing year at Grace. I am. Because of the Healthy Church Initiative, because of the expansion of 1417, because of the new high school, because we have leaders in the congregation who have wanted to see it grow for many years but for whatever reason it hasn't. That fire is still there. I've seen it and heard it recently. And I believe that when several people begin saying the same things unconnected to each other that's evidence of the Spirit already increasing territory. So let's see/listen/discern what God is up to here on Canyon Creek Drive.